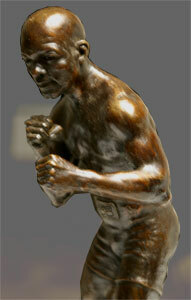 He is the very symbol of Philadelphia's great boxing history. 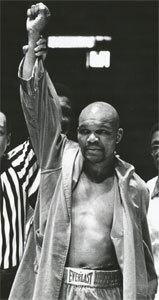 One of the hardest punching, toughest, most accomplished and most popular of Philly ring attractions, Bennie Briscoe is the inspiration for our award. 1 no contest and 53 knockouts. He fought for the middleweight championship three times and although he never took the crown, he is considered one of the best to never win a world title. With his shaven head, menacing stare, pawing style and pulverizing power - especially to the body, Briscoe thrilled Philadelphia crowds at the Spectrum, Blue Horizon, Arena, Convention Hall, and the Cambria, as well as global boxing fans all over the world. He was a working class fighter and a champion of the people. No other boxer better personifies the Philly fighter. Now Bennie Briscoe's legacy is further set. From now on, Philadelphia boxers will be awarded in the name of this great fighter. And his image will now rest upon the trophy shelf of the very best of the new generation of fighters. Briscoe's skill and accomplishments have become the measuring stick for all those who do battle in the city of Philadelphia. They may be good, but are they a Briscoe Award winner? Every year PhillyBoxingHistory.com will honor great personalities and events of Philadelphia's past as well as name a "Fighter of the Year" and Fight of the Year" from the current local boxing scene. Public nominations for the current scene categories ("Philly Fighter of the Year" & "Philly Fight of the Year") are accepted via e-mail. Winners in these two categories are determined by on-line voting, paper ballots cast at local boxing events, and polling of Philadelphia-area boxing media. Briscoe Awards are given out at local public events such as boxing cards and other events. LeVotch, a native of New Jersey, is a life-long boxing fan who learned about the sport while training in the Philly gyms and attending fights at the Arena, the Spectrum and the other hallowed halls of Philadelphia boxing. His fluency in the language and form of boxing along with his ingrained familiarity with Bennie Briscoe informed his inspired work on this project. 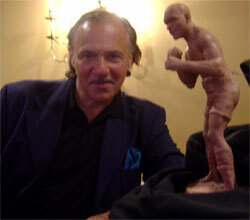 LeVotch is also the creator of the popular boxing statues "The Spirit of Boxing" and "The End of the 9th". 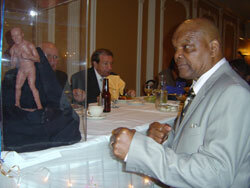 Phillyboxinghistory.com is the only web site dedicated to recording and honoring Phila-delphia's boxing legacy. Perhaps the best fight city in the world, Philadelphia is home to the finest prize fighters, wisest trainers, savviest promoters, toughest boxing gyms and the most memorable bouts in the history of the sport. And phillyboxinghistory.com is the home of everything that is Philadelphia boxing. The web site offers a comprehensive look at the boxers, the arenas, the gyms, the fights, the managers, promoters, cut men, and all other aspects of the subject. Further, our Briscoe Award now honors boxing history in the making, while our Gravestone Program honors fallen fighters who gave so much to the sport we love.